How Can Agencies Effectively Implement Artificial Intelligence? Managing data, workforce, and risk can help agencies to enhance the successful adoption of AI in improving mission and program performance. As the public sector adopts new technologies to improve their operations and service delivery, artificial intelligence (AI) increasingly enables a cognitive government in which leaders leverage AI and machine learning to interact with citizens and make better decisions. At the same time, implementing AI well requires a focus on sound technology management and attention to related critical success factors. 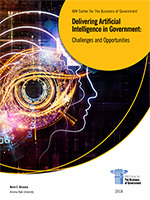 Today, the IBM Center for The Business of Government is releasing a new report to help agencies understand effective practices in adopting AI and cognitive technologies: Delivering Artificial Intelligence in Government: Challenges and Opportunities, by Kevin Desouza, ASU Foundation Professor in the School of Public Affairs at Arizona State University. In the report, Prof. Desouza reviews recent progress made in applying artificial intelligence to public sector service provision, drawing on lessons learned from commercial experi­ence as well as burgeoning cognitive computing activity by Federal, State, local, and international governments. The report draws on this real-world experience to set forth a framework for agencies to plan, develop, and deploy AI systems. The author then puts forward a set of challenges for government leaders and innovators in this space, along with opportunities for agencies to act in addressing these challenges. Finally, the report outlines a maturity model for agencies to use in guiding their jour­ney forward in applying AI to improve mission performance. Upgrading IT infrastructure to support AI systems, leveraging cloud computing technologies. Identifying data intensive applications that can benefit from AI, and establishing data governance to take best advantage of the benefits that AI can deliver. Enabling a skilled public sector workforce to use AI, including through agile implementations and redesigned work processes. Developing AI in a manner that augments human decisionmaking, and follows ethical imperatives around transparency, security, auditability, and citizen involvement. Working in partnership with government, academia, and industry. This work follows on our recent report with the Partnership for Public Service that identifies case studies of government success in this space, The Future Has Begun: Using Artificial Intelligence to Transform Government. We hope that agencies will find the practical and actionable steps offered in this report to be useful in capitalizing on the potential for AI to improve government.